Installing a roof is one of those things that you may only do once in while in the lifetime of your business, so it can be hard to tell whether the job has been done right and satisfactorily. You are also probably unfamiliar with the right products to use, and the procedures that best address your particular commercial roofing needs. As such, it is important to know that you can trust the roofing contractor you select to offer you the best advice about the products and procedures that may be unfamiliar to you. You cannot select the right professional roofer by simply comparing estimates and prices. You need some time to sit down with each contractor, whether it is the salesperson or contractor himself, so you can discuss the details of your roofing needs. The key is to find the right professional roofing contractor for your job, which you can assess through observation and interviews. Good roofers take pride in their work, and this should be portrayed by the salesperson representing the company. Does the salesperson/contractor show pride and enthusiasm in discussing previous roofing jobs? Does the salesperson/contractor seem adequately informed about previous jobs? This should tell you their level of involvement in the actual roofing work. 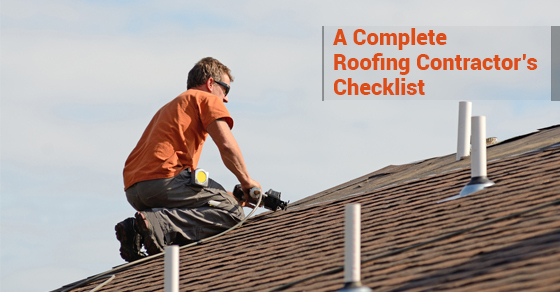 The checklist below should help you check the experience, reliability, and reputation of a contractor, as well as their dedication to delivering the best roof system possible. Does the contractor have a legitimate business location (not run out of a home/ pickup truck)? What is the exact business location? Never use a contractor without a physical address. Additionally, a contractor with a nearby office should ideally offer better service and faster response time. Does the contractor have office support staff for customers (is the phone answered by a secretary)? Did the contractor make and keep scheduled appointments? Did the contractor offer personal appointments / site meeting with the owner? Are there service vehicles / reliable transportation? Did the roofer come with a truck and ladder for the estimate? Was the time taken to explain / review quotation? Did the estimator provide budget / material option? Was the scope of work explained? Were samples provided if asked for? Will contractor have work force capable of carrying out work? Will contractor provide full time onsite foreman available for customer’s access? Did quote specify means to address unknown work/ extra structural deficiencies should they arise? Will manufacturer carry out final inspection upon completion of work? Did contractor provide final inspection checklist? Will contractor carry liability insurance of at least $2,000,000 and provide their policy number? A contractor should carry workers’ compensation insurance and comprehensive liability insurance to protect you in case a roofing accident occurs. Was actual copy of WSIB certificate provided? Is contractor a member of the NRCA (National Roofing Corporation)? Is the contractor in good standing with the BBB? Does the contractor provide 24 hour emergency service? How can you reach them? Will they provide their cell phone information? Does the contractor provide follow-up questionnaire to ensure long term satisfaction? Did the contractor include a copy of product a warranty? Will the company be in business to honour their warranty? What is the proof? Does the company have the financial capability to back their warranty? Can the company provide customer references? Does the contractor have a license? Is it current? Can they provide the number? Has the contractor’s license ever been suspended? Why? Can contractor show completed projects done locally with the type of material you want? 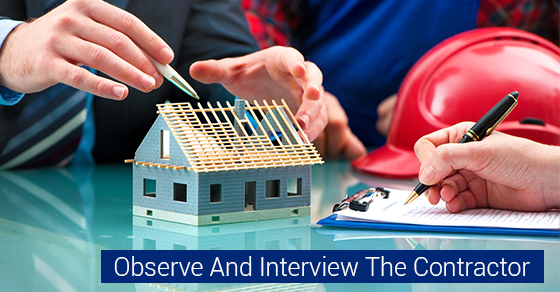 How does the contractor handle problems that arise on the job? You can find this out by requesting a referral from a previous job that had a complaint. Did the roofers perform their work promptly? Were they responsive when asked for changes? Did they act as if they were interested in the interests of the customer? Would they consider the company trustworthy? Make sure the company’s workmanship warranty (for installation job) and the manufacturer’s warranty (for roof material) specifications are clearly noted in the contract. Being confident that you have chosen a top-notch roofing contractor will help assure that you get the right roof overhead, that it is properly installed, and that your hard-earned money does not go to waste.